ww2dbaseAs recently as 1930, even prominent physicists such as Ernest Rutherford and Albert Einstein knew there were tremendous amounts of energy inside of atoms, but saw no way to release it. Things changed quickly, however, during the 1930s. In 1932, Sir John Cockcroft and Ernest Walton were able to cause a nuclear reaction for the first time by using artificially accelerated particles, and then in 1934, Irène and Frédéric Joliot-Curie and Enrico Fermi separately induced artificial radioactivity by bombarding atoms with alpha particles and neutrons, respectively. Finally, in Dec 1938, based on the work of Otto Hahn and Fritz Strassmann, Lise Meitner and Otto Robert Frisch published their theory of the potential of splitting uranium atoms. Coupled with the possibility of a chain reaction for a tremendous amount of energy release, people began to realize that artificially induced nuclear fission could be used as a powerful weapon. ww2dbaseOn 2 Aug 1939, Hungarian Jewish refugee in the United States Leó Szilárd co-authored a letter with Albert Einstein, urging President Franklin Roosevelt to allocate sufficient funding for atomic research due to the potential application as a weapon. The letter reached Roosevelt's desk in Sep, who agreed with the scientists' urging, and authorized the creation of the Uranium Committee under National Bureau of Standards chief Lyman Briggs, which began research programs at the Naval Research Laboratory in Washington, DC, United States in 1939. In 1940, the Uranium Committee was absorbed into the larger National Defense Research Committee. Nevertheless, progress was slow, partly due to the low sense of urgency as the United States had not yet entered the war. ww2dbaseMeanwhile, scientists in Britain also embarked on a similar mission. In Mar 1940, at the University of Birmingham, research done by Otto Frisch and Rudolf Peierls eventually led to the Scientific Survey of Air Warfare's finding that an uranium bomb could be produced using merely 25 pounds of uranium-235, which was a feasible size for a weapon. This was something that the leading German physicist Werner Heisenberg, the lead scientist for Nazi Germany's atomic weapon research program, never achieved. The friendliness between Britain and the United States allowed this new finding to be shared between the two nations, but Briggs made no effort of sharing this new report with his physicists. Briggs' failure ultimately led to the atomic weapon research program to be transferred directly under National Defense Research Committee's chief, Vannevar Bush, in Nov 1941. Briefly, the administrative headquarters of the research project was located at 90 Church Street in the Borough of Manhattan in New York City, New York, United States. Although it was soon moved, the name Manhattan remained with the project. The facilities at the remote Los Alamos, New Mexico housed the main group of researchers and was responsible for final assembly of the bombs. This location was code named "Site Y". 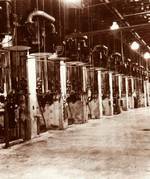 The facilities at Oak Ridge, Tennessee, which had ready access to hydroelectric power, enricheduranium-235 and conducted plutonium production research. This location was code named "Site X". The facilities at Hanford, Washington, which was near the Columbia River which supplied sufficient water to cool reactors, produced plutonium. This location was code named "Site W". ww2dbaseAll three locations were strategically located far enough in-land to minimize aerial attack by Germany or Japan. ww2dbaseIn an effort to better coordinate the weapons research, Roosevelt placed the US Army Corps of Engineers to oversee the operation. The first officer to head the effort was Colonel James Marshall, who failed to efficiently secure needed material for research and production. Replacing Marshall was Colonel Leslie Groves, who was the deputy in overseeing the successful completion of the large construction of the Pentagon building. Groves appointed Oppenheimer as the scientific director of the project, which surprised many due to Oppenheimer's radical political views. At the time, Groves renamed the project the Manhattan District, which secured the research project's legacy as the Manhattan Project. He was also promoted to the rank of brigadier general so that he would have adequate authority to deal with various issues with the project. ww2dbaseWhile the research continued, the US Army actively searched out for additional uranium. Groves gave the responsibility of searching out for more uranium to Colonel Kenneth Nichols, who promptly visited the New York City office of Edgar Sengier. Sengier was the director of Union Minière du Haut Katanga, a company that owned the world's largest uranium mine in the Belgian colony of Congo. As it turned out, Sengier had been hoarding uranium since the start of the European political tension between Germany and the west, knowing that the material was critical in the development of atomic weapons. He hid one secret stockpile of eight tons of uranium oxide in French Morocco (which later became the basis for France's post-war nuclear program) and another stockpile of 1,250 tons of uranium ore at Staten Island, New York, United States. The stockpile hidden at Staten Island was eventually purchased by Nichols for Manhattan Project. Sengier later became the only non-US citizen to win the Medal of Merit award from the United States; he also received honors from Belgium, the United Kingdom, and France. ww2dbaseOne of the first major hurdle overcame took place on 2 Dec 1942, where the team led by Enrico Fermi at the University of Chicago successfully initiated the first self-sustaining nuclear chain reaction in a reactor code named Chicago Pile-1, and the project began to reach milestones on a healthy rate. British efforts up to this point, however, were slower than expected due to the lack of funding and further slowed by the unwillingness of the United States to collaborate. In Aug 1943, finally, it was agreed during the Quebec conference that a team of British and Canadian researchers were to join the Manhattan Project so that the best of Anglo-American efforts could be coordinated efficiently. By Jan 1944, uranium and plutonium production had reached a stage where the scientists could build working models of their theories. Very quickly, a gun-type fission weapon was drawn out where a mass of uranium-235 was shot down a gun barrel into another mass of uranium-235, creating the critical mass necessary to trigger an explosion; this method was so certain to work that no test was necessary, though there was not enough uranium-235 to conduct such a test anyway. The resulting uranium bomb was code named "Little Boy". The plutonium bomb was made with the synthetic element plutonium-239, made from uranium-238. Originally, the gun-type fission weapon was also to be the plan for the plutonium bomb, code named "Thin Man". However, in Apr 1944, physicist Emilio Segrè at Los Alamos discovered the gun-type trigger device was completely unsuitable for plutonium-239, and the gun-type trigger for the plutonium bomb was totally abandoned in Jul 1944, ending the "Thin Man" portion of the project. The alternative method to detonate the plutonium bomb, unlikely as it seemed at the time, was implosion, where a sub-critical mass of plutonium would be forced to collapse in on itself during a chemically-induced explosion, creating critical mass due to increased density. This method was only achieved after a reorganization that dedicated just about every scientist of the Manhattan Project to research this problem. I did suggest [the name Trinity]... Why I chose the name is not clear, but I know what thoughts were in my mind. There is a poem of John Donne, written just before his death, which I know and love. From it a quotation: "As West and East / In all flatt Maps-and I am one-are one, / So death doth touch the Resurrection.... That still does not make a Trinity, but in another, better known devotional poem Donne opens, "Batter my heart, three person'd God." ww2dbaseThe test for the implosion-style plutonium weapon was scheduled for 16 Jul 1945 at a location 35 miles southeast of Socorro, New Mexico, in the northern sector of the Alamogordo Bombing Range (now the White Sands Missile Range). The site was chosen to be remote enough to keep the test secret, plus the strength of the explosive was unknown so that the site's distance from civilization added a buffer zone. Planning for the test was assigned to Kenneth Bainbridge, a professor of physics at Harvard University, working under explosives expert George Kistiakowsky. An array of scientific equipment was gathered to retrieve data, while dozens of cameras operated by Berlyn Brixner's team were deployed to capture the visuals. From a military perspective, soldiers arrived as early as fall 1944 to safeguard the physical security, and by early 1945 checkpoints were established throughout the grounds, manned by military policemen. ww2dbaseOn 7 May, more than two months before the test, a test explosion of 108 tons of TNT was conducted to calibrate the instruments. The scientists' predictions for the test spanned across the entire spectrum. 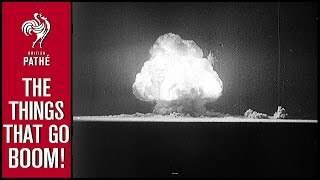 Some of them predicted that the test would fail to produce any energy at all, while others thought the test would trigger the detonation of the entire atmosphere, thus laying the surface of the Earth to waste. Physicist I. I. Rabi, who predicted that the explosion would yield the same energy as 18 kilotons of TNT, would come closest to the actual result. The lighting effects beggared description. The whole country was lighted by a searing light with the intensity many times that of the midday sun. It was golden, purple, violet, gray, and blue. It lighted every peak, crevasse and ridge of the nearby mountain range with a clarity and beauty that cannot be described but must be seen to be imagined. ww2dbaseTo cover up, the Alamogordo Air Base issued a press release noting that an ammunition dump exploded in an accident which caused no injuries, and the crater was filled as soon as observations were made by the scientists. The event remained in secret until after the destruction of Hiroshima on 6 Aug 1945. Three days after Hiroshima, Nagasaki was destroyed by the atomic bomb "Fat Man" which had the same design as the "Gadget" bomb used for Operation Trinity. On 12 Aug, the Smyth Report was released to the public with some technical information about the test. ww2dbaseThe successful Operation Trinity test was considered by many as the start of the Atomic Age, as it was the test of a nuclear weapon technology. In 1952, the site of the explosion was bulldozed, and the remaining Trinitite was disposed of. Residual radiation remained as high as ten times higher than naturally occurring radiation even after 60 years. ww2dbaseSoviet efforts to develop an atomic weapon began in Sep 1941, headed by Igor Kurchatov. The Soviet program was significantly smaller than its American counterpart, but it progressed relatively quickly due to an effective spy network that involved Los Alamos researchers Klaus Fuchs and Theodore Hall (who did not know that the other was also a spy). ww2dbasePhysicist Werner Heisenberg was the chief of Germany's efforts to develop an atomic bomb, who failed to build a reactor partly due to him heading down the wrong direction by using heavy water as a neutron moderator. His research was further hampered by Allied efforts that denied the German research program of heavy water. After the war, Heisenberg insisted that he had never intended to use his research as a weapon in any case even though his in-progress heavy water reactor was built by government money. ww2dbaseJapanese researchers focused on uranium much like the American effort. Lieutenant General Takeo Yasuda of the Aviation Technology Research Institute of the Japanese Army was placed in charge of the research. He secured deposits of uranium ore in northern Korea, and invited Yoshio Nishida, Japan's leading nuclear physicist, to lead the scientists. In Hungnam, Korea, Japan constructed a nuclear installation and rumored to have successfully conducted a nuclear explosion at the site on 10 Aug 1945, four days after the Americans destroyed Hiroshima and Nagasaki. The Japanese installation at Hungnam was later dismantled and brought back to Russia by Soviet troops, with all of the remaining nuclear material, without any prior discussion with their Anglo-American allies. ww2dbaseSources: Armchair Reader World War II, Wikipedia. 16 Jan 1939 Austrian physicists Lise Meitner and Otto Frisch successfully achieved nuclear fission in an experiment in Sweden. 25 Jan 1939 Uranium atom was split for the first time at Columbia University in the United States. 26 Jan 1939 President Franklin Roosevelt approved atomic research efforts in the US. 2 Aug 1939 In a letter written by Leó Szilárd and signed by Albert Einstein, the two physicists urged US President Franklin Roosevelt to allocate funding for atomic weapons research. 11 Oct 1939 Leó Szilárd and Albert Einstein's letter (sent on 2 Aug 1939) reached Franklin Roosevelt, who agreed to establish a committee for the research of nuclear energy as a weapon. This led to Roosevelt's decision to establish the Uranium Advisory Committee shortly after. 21 Oct 1939 The Uranium Advisory Committee in the United States, headed by Lyman Briggs of the National Bureau of Standards, met for the first time. The committee had a budget of US$6,000 at this time. 10 Apr 1940 Henry Tizard established the Military Application of Uranium Detonation (MAUD) Committee in the United Kingdom to investigate the feasibility of an atomic weapon. 1 Jul 1940 The responsibility for nuclear fission research in the United States was transferred to the National Defense Research Committee under Vannevar Bush. 23 Feb 1941 Dr. Glenn T. Seaborg chemically identified the recently discovered new element Plutonium in the 60-inch cyclotron at the University of California at Berkeley, California, United States. 26 Feb 1941 American scientists Glenn Seaborg and Arthur Wahl discovered Plutonium. 17 May 1941 Arthur Compton and the United States National Academy of Sciences published a report noting the success rate of developing an atomic weapon was favorable. On the same day, Vannevar Bush created the Office of Scientific Research and Development (OSRD). 2 Jul 1941 The British Military Application of Uranium Detonation (MAUD) Committee assigned the responsibility of writing its final draft of the report of its findings on the development of atomic weapons to James Chadwick. 15 Jul 1941 The British Military Application of Uranium Detonation (MAUD) Committee issued its final report on atomic weapons. 17 Sep 1941 At a conference in Copenhagen, Denmark, German physicist Werner Heisenberg warned his mentor Niels Bohr that Germany had embarked on atomic weapon research and gave him a drawing of a reactor as proof. 3 Oct 1941 The official copy of the British Military Application of Uranium Detonation (MAUD) Committee Report, written by James Chadwick, reached Vannevar Bush. 9 Oct 1941 Vannevar Bush took the British Military Application of Uranium Detonation (MAUD) Committee Report to US President Franklin Roosevelt, who agreed to work together with the British to develop atomic weapons. 6 Dec 1941 Vannevar Bush and Arthur Compton assigned Harold Urey to develop research into gaseous diffusion as a uranium enrichment method and Ernest Lawrence to investigate electromagnetic separation methods. 18 Dec 1941 The S-1 Section of the United States Office of Scientific Research and Development, the forerunner of the Manhattan Project, held its first meeting. 25 Jun 1942 The US Office of Scientific Research and Development (OSRD) S-1 Executive Committee held a meeting to discuss the location of manufacturing facilities for the Manhattan Project. 1 Jul 1942 Chief Engineer of the Manhattan District Colonel James C. Marshall and his deputy Lieutenant Colonel Kenneth Nichols surveyed the Knoxville, Tennessee, United States region for suitable sites for Manhattan Project manufacturing, but they were not entirely satisfied by the sites presented to them by the Tennessee Valley Authority. 13 Sep 1942 At a meeting of the S-1 Section Executive Committee of the United States Office of Scientific Research and Development (OSRD), a decision was reached to build a laboratory to study fast neutrons. This study was to be codenamed Project Y. 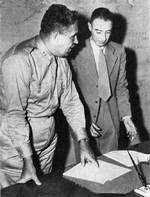 17 Sep 1942 Leslie Groves was given charge of overseeing the Manhattan Project. 24 Sep 1942 Leslie Groves purchased 210 square kilometers (52,000 acres) of land in Tennessee, United States. Also known as Site X, it would soon become the Oak Ridge site of the Manhattan Project. 26 Sep 1942 The Manhattan Project was given permission to use the highest wartime priority rating by the United States War Production Board. 28 Sep 1942 The Ohio River Division of the US Army Corps of Engineers opened up an office in Harriman, Tennessee, United States to begin acquiring land, by purchase and the implementation of Eminent Domain, for Site X of the Manhattan Project. 6 Oct 1942 The District Court for the Eastern District of Tennessee, United States issued an order to take possession of land for Site X of the Manhattan Project. 15 Oct 1942 Robert Oppenheimer was appointed, by Leslie Groves, to coordinate the scientific research of the Manhattan Project at Site Y, a location yet to be finalized. 6 Nov 1942 Groves and Oppenheimer visited Los Alamos, New Mexico, United States and agreed that it was suitable as the location for Site Y for the Manhattan Project. 2 Dec 1942 Enrico Fermi's atomic reactor Chicago Pile-1 at the University of Chicago, Illinois, United States initiated the world's first self-sustaining nuclear chain reaction. 18 Feb 1943 The construction for a large electromagnetic separation plant for enriching uranium, codenamed Y-12, began construction at Manhattan Project's Oak Ridge site in Tennessee, United States. 28 Feb 1943 Construction began on the first full-scale plutonium production reactor in the world at Hanford, Washington, United States. 1 Apr 1943 Access to the Clinton Engineer Works facilities in Tennessee, United States became strictly controlled. 19 Aug 1943 As discussed in the Quebec Conference between US President Franklin Roosevelt and British Prime Minister Winston Churchill, British scientists, including Klaus Fuchs, were to join the Manhattan Project. 4 Oct 1943 Construction began for the first nuclear reactor at the Hanford Site of the Manhattan Project in Washington, United States. 3 Mar 1944 An American B-29 bomber dropped a dummy atomic bomb at Muroc Army Air Force Base in California, United States at the altitude of 24,000 feet. The test bomb considerably damaged the aircraft's bomb bay doors as it exited the aircraft. 5 Apr 1944 At Los Alamos, New Mexico, United States, Emilio Segrè received the first sample of reactor-refined plutonium from Oak Ridge, Tennessee, United States. He would soon discover that the spontaneous fission rate of this plutonium was too high for use in a gun-type fission weapon. 4 Jul 1944 J. Robert Oppenheimer revealed Emilio Segrè's final measurements to the Manhattan Project scientists at Los Alamos, New Mexico, which concluded that the "Thin Man" design for a gun-type plutonium weapon was not feasible. 20 Jul 1944 The staff at the Los Alamos site of the Manhattan Project shifted focus to work on the implosion mechanism for the atomic bomb. 25 Jul 1944 The first preliminary test of the RaLa Experiment was performed by the scientists of the Manhattan Project; it was the first in a series of experiments attempting to create a spherical implosion to detonate a nuclear weapon. 2 Sep 1944 While attempting to unclog a uranium enrichment device at the Philadelphia Navy Yard, Pennsylvania, United States for the Manhattan Project, chemists Peter Bragg, Douglas Meigs, and Arnold Kramish accidentally set of an explosion, which sprayed liquid uranium hexafluoride and hydrofuoric acid on them. Bragg and Meigs were killed, while Kramish and two soldliers, George LeFevre and John Tompkins, were seriously injured. 22 Sep 1944 The first RaLa Experiment of the Manhattan Project with a radioactive source was performed. 9 Dec 1944 The US Army Air Forces established the 509th Composite Group for atomic weapon delivery. 14 Dec 1944 The RaLa Experiment of the Manhattan Project yielded evidence that spherical implosion was possible for compression of the plutonium pit of an atomic bomb. 17 Dec 1944 The newly established USAAF 509th Composite Group was activated. The group's mission was to deliver atomic weapons. 7 Jan 1945 The RaLa Experiment of the Manhattan Project conducted its first test using exploding bridgewire detonators. 14 Jan 1945 The RaLa Experiment of the Manhattan Project conducted its second test using exploding bridgewire detonators. 13 Apr 1945 More than 300 American B-29 bombers attacked various targets in and near Tokyo, Japan. The smaller of the two cyclotrons at the Riken Institute was destroyed. 11 Jun 1945 James Franck and other Metallurgical Laboratory scientists issued the Franck Report, arguing for a demonstration of an atomic bomb before using it against an enemy target. 1 Jul 1945 The civilian Monsanto company took over the operation of the Clinton Laboratories at Site X of the Manhattan Project in Tennessee, United States. 16 Jul 1945 The Americans successfully detonated an atomic bomb at Alamogordo Bombing Range in New Mexico, United States. The test blast created temperatures 10,000 times the surface temperature of the sun and was felt 200 miles away. The explosion was the equivalent of 20,000 tons of TNT and throws a column of fire and smoke 35,000 feet into the night sky. The authorities hid the blast by claiming that an ammunition dump had gone up. 24 Jul 1945 US President Harry Truman informed Soviet leader Joseph Stalin that the United States had successfully constructed atomic weapons. Stalin showed surprise, but in actuality he had already learned this through the Soviet intelligence network. 12 Aug 1945 The Smyth Report, written by American physicist Henry DeWolf Smyth, with the history of the development of the atomic weapons, was released to the public. 17 Oct 1945 Norris Bradbury succeeded Robert Oppenheimer as the director of the Los Alamos, New Mexico, United States facility of the Manhattan Project. 10 Nov 1945 United States Secretary of War Robert Patterson ordered all cyclotrons in Japan destroyed. 24 Nov 1945 Per orders of United States Secretary of War Robert Patterson, all cyclotrons in Japan were destroyed. 1 Mar 1946 Private medical practices were allowed at Site X of the Manhattan Project in Tennessee, United States. 10 Sep 1946 Union Carbide, the civilian firm charged with the running of plants K-25, Y-12, and X-10 at Site X of the Manhattan Project in Tennessee, United States, signed a contract with the union United Chemical Workers. 18 Dec 1946 Monsanto, the civilian firm charged with the running of the Clinton Laboratories at Site X of the Manhattan Project in Tennessee, United States, signed a contract with the union Atomic Trades and Labor Council. 31 Dec 1946 The Manhattan Project was brought to a close. 1 Jan 1947 The Atomic Energy Act of 1946, signed into American law by US President Harry Truman on 1 Aug 1946, came into effect. Manhattan Project was thus turned over to the newly established civilian United States Atomic Energy Commission. 1 Mar 1949 The military hospital at the Oak Ridge site of the Manhattan Project in Tennessee, United States was transferred to civilian control by the Roanne-Anderson Company, a subsidiary of the Turner Construction Company. 19 Mar 1949 The residential and commercial sections of Oak Ridge, Tennessee, United States were opened to public access for the first time. When the world entered the Atomic age, it was unclear just what the future would bring. A whole new set of rules and agreements spoken and unspoken, moves and counter-moves. Nations would re-think,Enemies became Friends Friends became Enemies. Never, Ever, Underestimate your Enemy, don't ever think, you hold all of the Technology, because some other country just might suprise you. This is true for Yesterday, Today and Tomorrow. Remember when your #1,#2,#3 and #4 all want a crack at you. Friends have become Enemies, and Enemies have become Friends, and you must always remember that. Always hold the high ground, this way you can spot trouble. When it comes to National Interests, you must always protect yourself. Protect yourself no one else will. When you show weakness, your enemies gather. If a Nation has to show Military force, use it, and use it with overwhelming force this gets respect of both friends and enemies and other forces in the shadows. Those who stood by you, will always have your protection. If one day you must fight a battle alone, remember where your friends were. These are my opinions alone, they do not in any way reflect the views of the WW2DB. At one time, I was only a soldier and not a diplomate, so I can only tell you the truth. Bikini: Bikini atoll is in the Marshall Islands, and is one of 29 atolls and 5 single islands Is. that Form the Republic of the Marshall Islands. Bikini is best known for its roll in testing nuclear weapons by the United States in the late 1940's and 1950's. But did you know: Prior to World War II the Japanese started to fortify Bikini atoll,to guard against an American attack. However,during the Pacific campaigns, Bikini became a stronghold that was passed up by U.S.forces. The Marshall Islands were taken back by U.S. forces in August 1945. Historians believe the use of the two piece swimsuit that we call the Bikini, was first used around 300 BC by ancient Roman women that was a fashion statement of that time. There is no creditable evidence which shows that Japan had ever tested a nuclear weapon. Both the Navy and Army had projects to create a nuclear weapon. Both of which did not progress beyond the laboratory. The Navy abandoned its project early on, believing that it would take many more years for even the United States to build a viable weapon. The Army pressed on with its project only to see it come to an end when the building housing the project was destroyed during an American fire bombing. Former Atlanta Constitution reporter and army intelligence officer David Snell of the 24th Criminal Investigation Detachment in Korea authored a report for the International Military Tribunal of the Far East which stated that Hideki Tojo had planned to wage nuclear war if his scientists had been successful. According to Snell, the Japanese project staff had been captured by Russian troops at Konan only three days after they had almost completed a functioning atomic bomb. Following his discharge Snell wrote up the story for the Atlanta Constitution, which published it in 1946. In the story, Snell alleged that the Japanese had successfully tested a nuclear weapon near Konan before being captured by the Russians. He claimed that he had received his information from a Japanese officer who had been in charge of counter-intelligence at Konan. Though no credence was placed in the story by SCAP officials, it was nonetheless thought necessary to get comments from Japanese scientists who would or should have known about such a project. Bunsaku Arakatsu called the article "false and fantastic" as he was personally acquainted with the few people capable of such a project, and said that Japan's nuclear research had never progressed beyond the laboratory stage, nor had any thought been given to the construction of a pilot plant for the production of nuclear material. Further doubt is cast on Snell's story by the lack of evidence of large numbers of Japanese scientists leaving Japan for Korea and never returning. The 1985 book "Japan's Secret War: Japan's Race Against Time to Build Its Own Atomic Bomb"by Robert K. Wilcox reprinted the Snell material as part of its investigation of Japan's World War Two nuclear research. In addition to detailing the known Japanese army and navy efforts, the book cited numerous intelligence reports and interviews which indicated the Japanese might have had an atomic program at Konan and offered evidence that the Japanese Navy, taking up the atomic project after Nishina’s separator at Riken had been destroyed, had accelerated Japanese efforts to make a nuclear weapon. A review by Department of Energy employee Roger M. Anders appeared in the journal Military Affairs: Journalist Wilcox' book describes the Japanese wartime atomic energy projects. This is laudable, in that it illuminates a little-known episode nevertheless, the work is marred by Wilcox' seeming eagerness to show that Japan created an atomic bomb. Tales of Japanese atomic explosions, one a fictional attack on Los Angeles, the other an unsubstantiated account of a post-Hiroshima test, begin the book. (Wilcox accepts the test story because the author [Snell], "was a distinguished journalist"). The tales, combined with Wilcox' failure to discuss the difficulty of translating scientific theory into a workable bomb, obscure the actual story of the Japanese effort: uncoordinated laboratory-scale projects which took paths least likely to produce a bomb. In the historical journal Isis, two historians of science said only of Wilcox's work that his thesis stood "on the flimsiest and most unconvincing of grounds," and surmised that the hidden agenda of such conspiracy theories was "to furnish a new exculpation for America's dropping of atomic bombs on Hiroshima and Nagasaki." An article published in the journal "Intelligence and National Security" in 1998, based on a review of many of the same documents used by Wilcox, and more, came to a similar conclusion. The article cited several US military intelligence documents and Japanese corporate records of the Nitchitsu firm that ran most of the industry in Hungnam and found no substantive evidence of any nuclear research program existing there during the war. As a result of Wilcox's book, two nuclear scientists active in World War II were interviewed by Bernard Shaw on American television (CNN) in the late 1980s. These were American scientist Glenn Seaborg (discoverer of plutonium) and former Japanese citizen, Professor Paul Kuroda, who was then a faculty member at the University of Arkansas, and who had worked on the fringes of the modest Japanese nuclear program during the war. Both Seaborg and Kuroda thought the claim that Japan had tested a nuclear weapon was absurd. Kuroda was aware that Japan had been studying the possibility of nuclear weapons, but that the program had not progressed to the point of actually enriching uranium, which is a necessary step in producing a uranium bomb. Neither Germany nor Japan had the industrial capacity to create an atomic bomb. Only the United States had the industrial and natural rescources to create a weapon in the time allotted. Only the United States had both the theoretical and engineering expertise and capacity to create a nuclear weapon.